Within a raid environment, approaches 1 and 2 serve reasonably well. The numerical index system used in a group can get a little tricky, though. Because, while it’s possible for you to heal the thirty-second member of your raid by saying, Mend 32 to issue the /use [raid32] Swiftmend command, it’s difficult and kludgy to identify raid members visually (it would also likely conflict with your group-healing macro, depending on where your group falls within the raid). But by leveraging any one of the many grid-style raid addons, it’s possible to solve both of these issues. Displacer Beast Teleports you up to 20 yards forward, activating Cat Form and increasing your movement speed by 50% for 4 2 sec. Guardian Affinity You gain: Thick Hide Reduces all damage taken by 10% 6%. Mass Entanglement Roots the target in place for 20 30 sec and spreads to additional nearby enemies. Damage may interrupt the effect. Usable in all shapeshift forms. This will be an annoying change to Displacer Beast whose trailing speed increase has never struck me as particularly overpowered and is likely intended as a reduction to PvP performance. 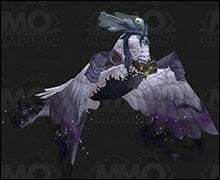 The decreased damage reduction associated with Guardian Affinity will be painful for Restoration Druids who choose that affinity for raiding (and is also likely PvP-driven). The change to Moment of Clarity is very nice and may prompt me to forgo Flourish and Stonebark to finally give this talent a try. May the Legendary Gods smile upon you and grant you good fortune (or may you benefit from what seems like a server glitch and pick up a couple of Legendaries within the same 24-hour period like I did)! There are many other changes affecting Guardian, Feral, and Balance specs as well as a long list of PvP-specific changes, so be sure to check out the full patch notes over at MMO Champion.